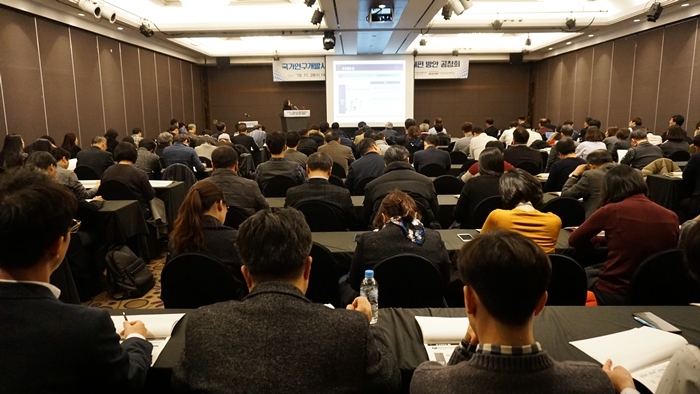 Ministry of Science and ICT (MSIT) and KISTEP held an open forum on ‘Amendment (draft) of R&D Preliminary Feasibility Study system of national R&D programs’ at The-K hotel Seoul on November 28th (Wed), 2018. After the function of Preliminary Feasibility Study of national R&D programs (hereinafter ‘R&D PFS’) was transferred from Ministry of Economy and Finance (MOEF) to Ministry of Science and ICT (MSIT) on April 17th of this year, MSIT established ‘The Innovation plan of PFS system of national R&D programs’ and improved the system for urgent and important issues for a start. Accordingly, PFS aims to ①strengthen expertise in science and technology, ②be conducted fast, and ③improve the convenience of applicants. The amendment of R&D PFS system was proceeded as it is necessary to enhance system and rationale of planning new large-scale national R&D programs and to improve the analysis system so it would be applied commonly to diverse programs. The open forum was held to introduce revision (draft) of PFS criteria and to collect various opinions from researchers. 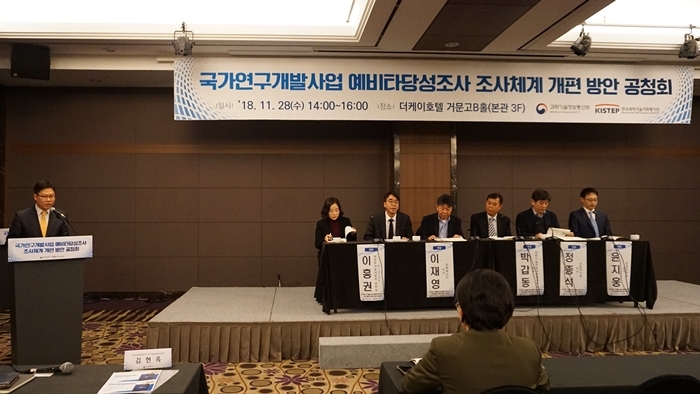 In the open forum, Chairman ▲Kapdong Park (Professor, Graduate School of University of Science and Technology) and panels of industry/ academia/ research experts from various fields including ▲Jae-Young Lee (CTO, Chorok ST), ▲Jongseok Jung (Research Fellow, Korea Institute for Industrial Economics&Trade (KIET)), ▲Ji-Woong Yoon (Professor, Kyunghee University), ▲Heung-Kwon Lee (Director General, KISTEP) participated and stated their views. Meanwhile, MSIT will confirm ‘Amendment (draft) of R&D PFS system of national R&D programs’ after collecting opinions from experts, discussing with MOEF and counseling with Evaluation Advisory Committee of national R&D programs. The relevant guidelines will be amended before the end of this year and applied to programs that are selected for PFS next year (the programs that are currently ongoing for PFS are also applicable, upon the request from the applied ministry or administration).